Here is a great wine to have after dinner. 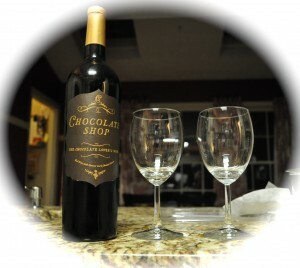 Chocolate Shop, the ultimate Chocolate Lover’s Wine is a deep, ruby red wine blended with rich, velvety chocolate. Inviting aromas of black cherry and dark chocolate combine in the glass and continue on the palate surrounded by hints of cocoa powder. Nuances of sweet red wine lingers on the smooth finish. Chocolate Shop provides you with an indulgent wine experience like no other.